Hands off touch technology like the tech demoed earlier this year by Neonode is going to be a hot topic for 2014, and Qualcomm will be in the middle of it. They were at CES this year to show off any number of tricks, and buried in the back of their booth was a demo which used the microphones on a Qualcomm tablet to listen for and track a special pen stylus. I got to watch as the stylus was used to write on paper (and see the scribbles show up on screen), and I also got to see the stylus manipulate another tablet without ever touching it. This was one of the more exciting tech demos at CES this year, and it is a big improvement over the similar feature that E-Fun integrated into a tablet in 2011. 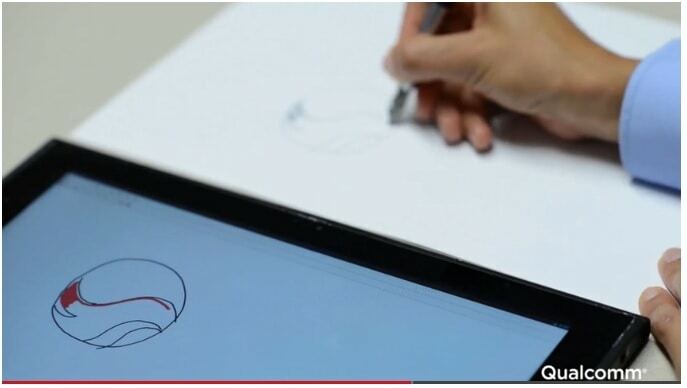 This tablet maker used sensor tech from a sister company (Pegasus) to create a tablet/stylus combo which could track what you write/draw on the paper next to it. That platform was restricted to only working when the paper and stylus were in one specific location, but the Qualcomm tech won't have that limitation. It could potentially affect everything from how we interact with mobile devices to sales of Wacom tablets (why spend hundreds on a special tablet when a smartphone can almost match the functions). And to make things even more interesting, picking up your pen on paper notes isn't all that this platform can accomplish. I also got to see the stylus be used to manipulate a tablet simply by pointing and clicking - no contact involved. This could also have some rather interesting effects on presentations. If you used this stylus as a pointer, the presenter could control a wall sized display. Sure, there are already was to do this, but this would be better than (for example) motion tracking, voice control, even standard tv remotes because the presenter wouldn't have to put up with pranksters interfering with the show (unless the prankster also has one of these pens).